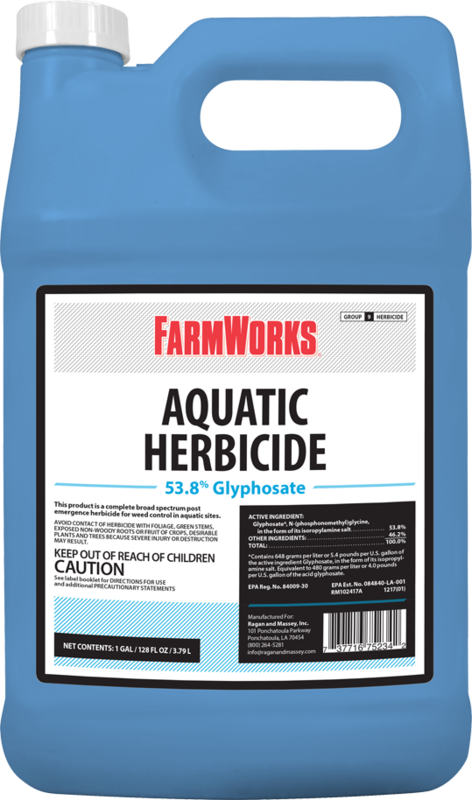 A broad-spectrum post-emergent weed killer, Farmworks Aquatic Herbicide can clear your pond of cattails, alligator weed, beachgrass, giant reeds, and several invasive plants that can’t wait to take over your water. This powerful 53.8% glyphosate solution eliminates targeted weeds down to the root while leaving soil and wildlife unharmed. For a full list of plants controlled, spraying instructions, and application recommendations, see the COMPLETE LABEL. This product effectively kills emerged weeds in all bodies of fresh and brackish water, whether they are impounded, flowing, or transient. This product does not control plants with foliage that is are completely or mostly underwater. This product does not control plants with foliage that is are completely or mostly underwater. Since this product is a post-emergent, systemic herbicide, it will give broad-spectrum control of most soft and woody plants as long as there are visible stems and leaves. For best results, apply when there are several days of calm, sunny days over 60 degrees (cloudy weather may delay results). Annual weeds are best controlled early in their growing season. Perennial weeds are best eliminated when treated at the later growth stages (prior to fruit and seed formation). If woody vines or brush is mowed or cut, wait until full leaf formation before treatment. Please see COMPLETE LABEL for weed stage, application, and cultural considerations. For optimal results, apply treatment only when Ideal application conditions are as present. Where good spray coverage is achievable, and wind speed is under 10 mph. Allow 7 or more days after treatment before reintroduction of water to achieve optimal weed control. Apply this product within one day after drawdown to ensure adequate application on actively growing weeds. Spray exposed foliage, taking care to avoid direct contact with water. To minimize wash-off, take care to avoid contact with spray boat or recreational boat backwash. Do not spray when rainfall is predicted within 6 hours of application. Do not retreat within 24 hours following the initial treatment. Treatment to moving bodies of water must be made while traveling upstream to prevent concentration of this herbicide in water. When making bankside applications, do not overlap more than one foot into open water. Do not spray in bodies of water where weeds do not exist. The maximum application rate of 7.5 pints per acre must not be exceeded in any single broadcast application that is being made over water (please see label for exceptions). When emerged infestations require treatment of the total surface area of impounded water, best practice is to treat the area in strips to avoid oxygen depletion that naturally occurs with decaying vegetation. Oxygen depletion may result in fish kill. Do not apply this product directly to water within a .5 mile upstream of an active potable water intake in flowing or standing water (a river, stream, creek, lake, pond, reservoir, etc.). There is no restriction on the use of treated water for irrigation, recreation, or domestic purposes. Do not use an irrigation system to apply product. Obtain a permit as necessary when applying product to public water.